The PEM 975 is basically the same as the KEM 975 (see HERE) but rotated 90º so that the cardioid response is in the vertical plane and the 30º pick-up is horizontal. As such it is ideal for table or lectern use where it will pick-up people of various heights, sitting or standing, without adjustments; while, at the same time, rejecting those people next to them. 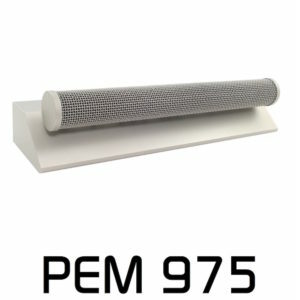 The PEM 975, like the KEM 975 and the earlier KEM 970, works according to the line-array principle. The new features are the low-noise circuit design and the redesigned power supply. The stylish power supply can be run as a desktop unit or mounted in a 19″ rack (the power supply is half rack width and can also be mounted in a half width housing). Specifications such as intrinsic noise or maximum sound pressure level have been improved using a new circuit design. The PEM 975 Cardioid Plane “Line-Array” Microphone consists of 8 critically spaced capsules, this microphone system achieves a vertical acceptance angle of just 30°, being significantly narrower than shotgun interference-tube technology, whilst avoiding the related phase problems. The wide cardioid characteristic in the vertical plane allows the PEM 975 to effectively cover a narrow sound stage, e.g speakers at a conference that can be taller or shorter, sitting or standing, whilst being able to record typically at distances up to 3 times that of an omni. The very narrow horizontal acceptance angle allows the microphone to reject the sound of people to the sides. • Video – and Teleconferencing, where the chairman has to be clearly heard, sitting or standing. • Speakers podia – The horizintal mounting ogf the PEM 975 enables clear speech of the speaker sitting or standing and the speaker can speak an aside to someone on his left or right without being heard.